The Veterans Florida Entrepreneurship Program gives veterans who have an idea for a business or who already run their own enterprise the knowledge and guidance they need to achieve success. 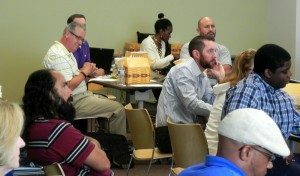 Veterans Florida, in partnership with six institutions of higher learning across the state, is offering a free Veterans Entrepreneurship Program. It provides participants with vital academic insights from top educators, the resources of seven veteran-friendly universities, the engaging support and wisdom of student peers and ongoing mentorship from community business leaders. Veterans are encouraged to sign up now. The initial 15-week instruction phase of the program combines independent online learning with in-class sessions that take place every two weeks on Saturdays and afford face-to-face input from peers and instructors. The second phase of the program provides ongoing mentorship from business experts. The program is structured to accommodate the demands of a busy, complex life. The broad geographical distribution of the participating universities makes it possible for students to attend the on-campus sessions near their home without having to fly anywhere and spend time away from their work and family. The resources of the participating schools are so plentiful and distinctive that they can easily meet the wide-ranging interests and needs of the veterans who enroll in the program. “Each school brings something different to the table,” says Carbonell. “They all have great qualifications and great entrepreneur instructors, but they all also provide unique opportunities. For example, UCF, one of our newest partners, is the home of the Defense Department’s Modeling & Simulation Program, and the school also has connections to the entertainment industry. So folks with a business idea who want to work in Computer Science, Virtual Reality or in an emerging technology area could have access to world-class resources at UCF that they would not be able to get anywhere else. The participating schools are also a good fit for veterans who come to class with a completely different set of life experiences than younger students who have not served in the military. The schools that make up the Veterans Florida Entrepreneurship Program network cater to veterans and make sure they get all the support they need. A number of veterans who have completed the inaugural Veterans Florida Entrepreneurship Program have launched and are building impressive businesses; the program’s successful track record is evidence of both its high caliber and relevance. Cases in point: Scott Neil, who owns American Freedom Distillery in St. Petersburg, Florida with several veteran partners; Keith Basik, who invented the Flip Towel (a workout towel worn on the wrist) and learned to perfect his pitch in the program; and Bradley Cantrell, the owner of Happy Hour Ice Cream. Carbonell explains that the program is a great starting point for anyone who either wants to start a business or has started a business but has had no professional help in evaluating the ideas and thinking through all the details that are so vital to success. “Our program can help connect you with all the right resources,” he says. “It’s never a good idea to go it alone and think you know all the answers. That’s when bad things start happening to entrepreneurs, so we highly recommend that you check out this program. When filling out the application, take care to provide quality information and do a good job of explaining your business idea or operating business.